He’s First Sergeant – later Captain – William Benjamin Whitaker of Henderson County, North Carolina. Last week saw the anniversary of his death at Fredericksburg, Virginia in 1862. 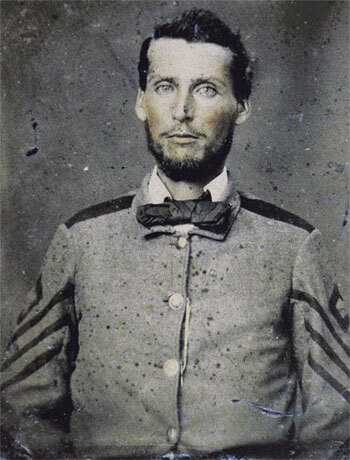 He’d enlisted in Company I of the 16th Infantry in May 1861 and was promoted Captain in April 1862. Looking into him, I found two extensive works online about North Carolina State Troops in the War. I’ll assemble hyperlinked tables of contents (hyperTOCs) for each to save a little time on future research. Officially the Roster of North Carolina troops in the War Between the States, John W. Moore’s 4 volume set was commissioned and funded by the North Carolina General Assembly in 1881 and published in 1882. It includes a listing of most officers and men who served in units organized by the State of North Carolina for Confederate service between 1861 and 1865. Although it has been superseded as a definitive reference by more recent and thorough scholarship, it has the advantages of being out copyright and online from GoogleBooks. I’m looking for information on a relative “John A. Thompson” who volunteered for the NC 23rd Regiment – served in K Company – wounded at Chancellorville and wounded again in the vicinity of the Spotsylvania Court House on May 9, 1864 and taken prisoner by Union forces and presumed dead. I am looking for William Bryant Edwards of Edgecombe County, NC. A quick search finds something promising … You’ll want to dig further to see if it’s your man. Interesting that his discharge in same month as birth of your subject’s second child. This company, known as the “Sparta Band,” was raided in Edgecombe County and enlisted at Sparta on Saturday, August 31, 1861. It was then assigned to the 30th regiment NC Troops and designated Company F. After joining the regiment the company functioned as a part of the regiment, and its history for the war period is reported as a part of the regimental history. From a roster posted on RootsWeb by Jo Webb. He’s also in Moore.